Corporate Security Officers are trained to maintain a high level of mannerism and polite first impression which covers the aspect of professionalism in order to meet the requirements of the corporate industry. They are first point contact for your visitors polite and courteous, efficient and vigilant, trained and professional. One of our specialist fields is providing the hospitality industry with hotel receptionists. We will provide you with neatly dressed, presentable receptionists that are well versed in dealing with clients from all walks of life and personalities. They will also know how to pacify an irate client and keep the image of the company intact. A receptionist is often the first business contact a person will meet at any organization. It is an expectation of most organizations that the receptionist maintains a calm, courteous and professional demeanor at all times, regardless of the visitor’s behavior. Some personal qualities that a receptionist is expected to possess in order to do the job successfully include attentiveness, a well-groomed appearance, initiative, loyalty, maturity, respect for confidentiality and discretion, a positive attitude and dependability. At times, the job may be stressful due to interaction with many different people with different types of personalities, and being expected to perform multiple tasks quickly. Our mission at Magenta Security is to provide world-class security services that are flexible and scalable so that when your business grows, so does your security. 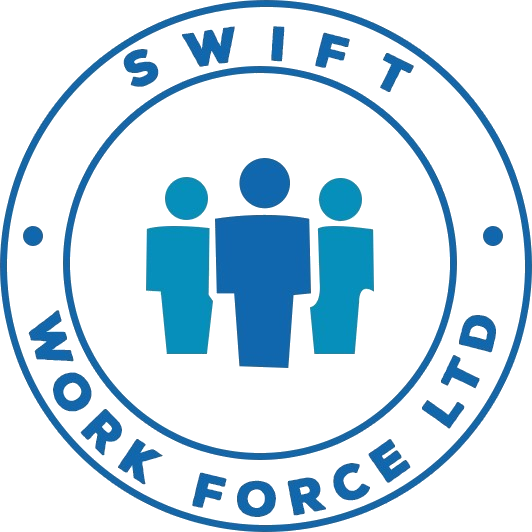 Copyrights © 2018 SwiftWorkForce. All Rights Reserved.